Do you wish you could monitor a wider area? How about monitoring a perimeter? 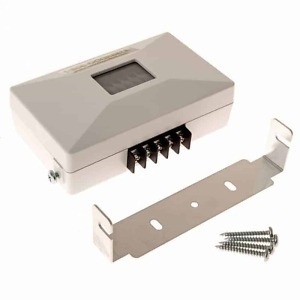 These break-beam sensors work with a Dakota Alert 2500 series receiver to alert you when the beams have been broken. The amazing range allows you to place them up to 250 feet apart and 2500 feet away from the receiver. No need to change batteries either – these are solar powered! Used in conjunction with the DCR-2500 receiver by Dakota Alert, the BBT-2500 Break Beam Sensors enhance your security by providing you with a larger entrance chime monitored area. Not to say that the two standard sensors that come with the break beam system are not good enough. They are, right out of the box the system can do anything you want and more. These solar powered break beam sensors are wireless, which means installation can be done in mere minutes as no electrical wiring needs to be done. The sensors are powered by a lithium-ion battery that will recharge in the sun. The sensors may be set at a maximum distance of 250 feet apart. When both beams between the sensors are broken, the sensors will send a wireless signal up to 2,500 feet away to the DCR-2500 receiver (sold separately or in the BBA-2500 kit.) Most entrance chimes available on the market today use one PIR beam per sensor to detect motion or movement. These sensors are called “break beam” sensors. Two PIR beams are sent and an alarm is triggered only when both beams are “broken.” This eliminates false alarms sometimes created by falling objects like leaves, for example. However, small animals may break both beams and it is therefore recommended sensors in a set be mounted off the ground, at least 3-4 feet high. Since this device is solar powered, it is designed to only be used outdoors. Great used in a car lot or scrap yard. You can set them up near your entrances to alert you whenever a potential customer enters the lot, or worse, a thief. Accessories such as sirens, strobe lights, and auto-dialers may be integrated into the DCR-2500 receiver to scare off intruders. In the other sense, you can monitor a business entrance for unlawful entry and exit. Since both of these types of businesses use a wide open type of lot, this device will work perfectly since they communicate over such a large distance. Safeguard Supply LRA-M1000 Long Range Motion Entrance Alert-1000 Ft.